Hello, and welcome to Child Inc. Let me be the first among many to tell you that at Child Inc.,, your child's everlasting success is our number one priority. Feel free to browse our site for any inquiries that you may have. Call us today to schedule an assessment. "Together we can make a difference in the life of your child, one step at a time." Located right in the heart of the Jack Britt District off of Fisher Rd., Child Inc. has been established for 14 years. At Child Inc., your child's success is our mission in life. "Child Inc. was created because we wanted to give back to the community in such a way that would affect generations to come for years. Let me be the first among many to welcome you to Child Inc."
Child Inc. offers a tutoring program to assist parents and teachers with holistic child development. Classroom observations and parent/staff conferences are available to assist in maximizing a comprehensive service. Child Inc. provides services to children pre-k through 12th grade. 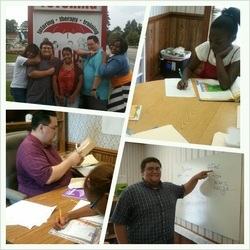 We also provide tutoring to college level students in select content areas. One-on-one as well as small group instruction is provided. The least restrictive setting is determined following a comprehensive assessment.
" The key to your child's success." "Covering all of your child's developmental needs!!!"